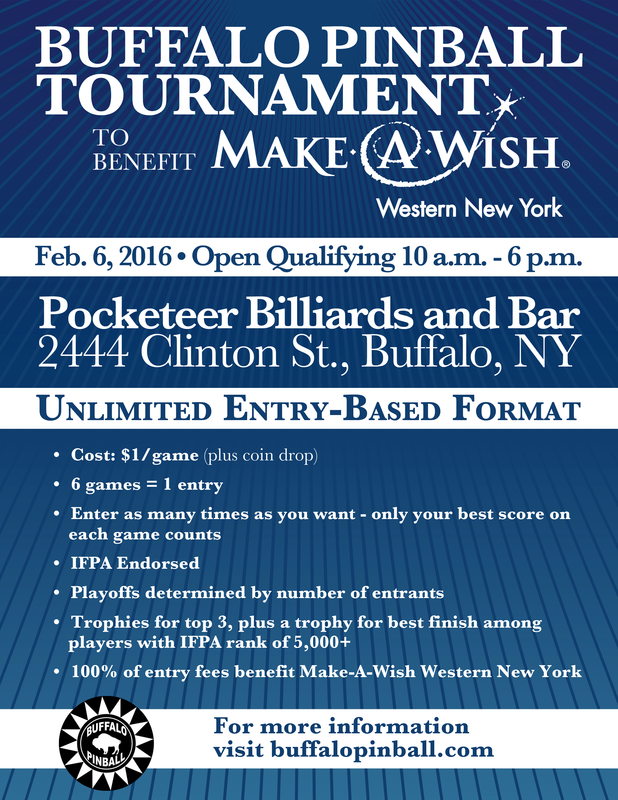 Buffalo Pinball is proud to be hosting an unlimited entry based tournament to benefit Make-A-Wish of Western New York. 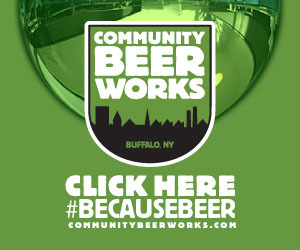 100% of entry proceeds will go to support Make-A-Wish of Western New York. THANK YOU to Tony Martin Awards for donating trophies for the tournament! Since this is for charity, no cash prizes will be given, but trophies will be awarded. This is an IFPA-endorsed event and WPPR points will be awarded. Q: How does the tournament format work? A: Players try to qualify for the playoffs by purchasing entry tickets and playing at least six of the ten machines in the “bank” of machines. 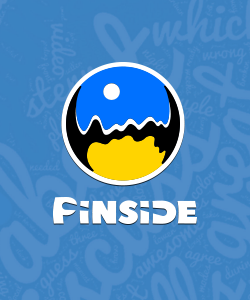 For example, say that bank of machines are: Iron Man, AC/DC, Kiss, Breakshot, Metallica, Avengers, Simpsons, T2, Space Shuttle, and Eightball Deluxe. You would need to play at least six of these machines to complete a “full” entry. Your scores on these machines are then compared to the scores that everyone else puts up on them during qualifying. You’re then awarded points based on your performance. A certain percentage of players with the most points will be in the playoffs. 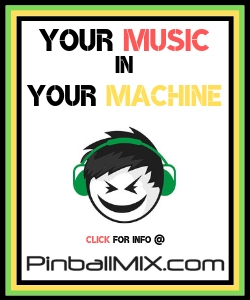 Q: Can I play the same machine multiple times in order to try to get a better score on it than my previous score? A: Yes – this is highly encouraged. Q: What if I play the same machine several times, and get a worse score than my previous score? A: Only your best score of the day will count on each machine. You can’t hurt yourself by playing more. Play as many times as you can to increase your chances of improving your score. Q: Do I have to be there all day? A: No, you can come anytime on Saturday, starting at 10am. You have until 6pm to try to qualify for the playoffs and can try to qualify anytime between 10am – 6pm. It’s up to you as to when you put in your entries. Come and go as you please. 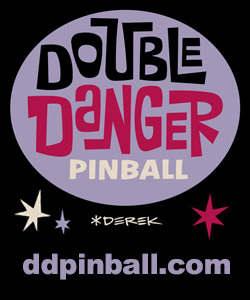 Q: I’m new to pinball. Should I come? A: Yes! It’s fun and for charity. 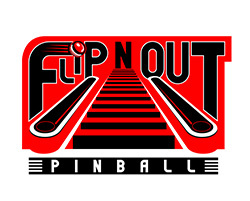 Plus, you’ll become a world ranked pinball player! Q: What if I buy entry tickets, but aren’t able to use them because qualifying ended? Will I receive a refund? A: No. It’s for charity. Congratulate yourself for doing something good. Q: Will there be games to play that aren’t part of the tournament? A: Yes! Yet another reason you should come. These will be on coin-drop of course. Q: Is there a “B” division for beginner/casual players? A: There is no separate division for this tournament, which means that all players will receive WPPR points for this tournament. We do have a trophy for the player that is ranked 5,000+ (including not ranked at all) that performs the best in the tournament. Q: Do I need to preregister? A: No, just show up on Saturday and purchase entries. Q: Is there a limit as to how many people can play in this tournament? Q: How many entries can I buy? A: As many as you want. A: This varies. It will cost you at least $6 for a full entry (you need to play six machines) plus paying the coin-drop on each machine (most games there cost $0.50 – $1.00. After that point, you can keep trying to improve your ranking in the tournament by playing the machines again and again at a cost $1 per attempt plus the coin-drop on the machine. Q: Why do I need to pay an entry fee plus the coin-drop on the machine? A: The machines are owned by Pocketeer and they are a business. Businesses need to make money to survive. Playoff format is 3 games per group, with 3,2,1,0 scoring. 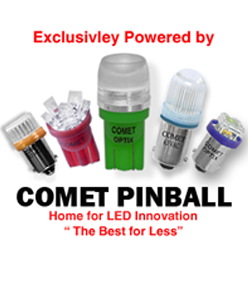 This entry was posted in Tournaments and tagged charity, make-a-wish, pinball, Tournaments on January 12, 2016 by k3v2.